Remember my post last week about our "haunted clock" and the pictures I posted of the first Nancy Drew book, The Secret of the Old Clock? I read that book when I was ten years old. I read a few more of the old hardcovers, too. But my Nancy Drew gateway drug? Hey, I was an '80s kid. 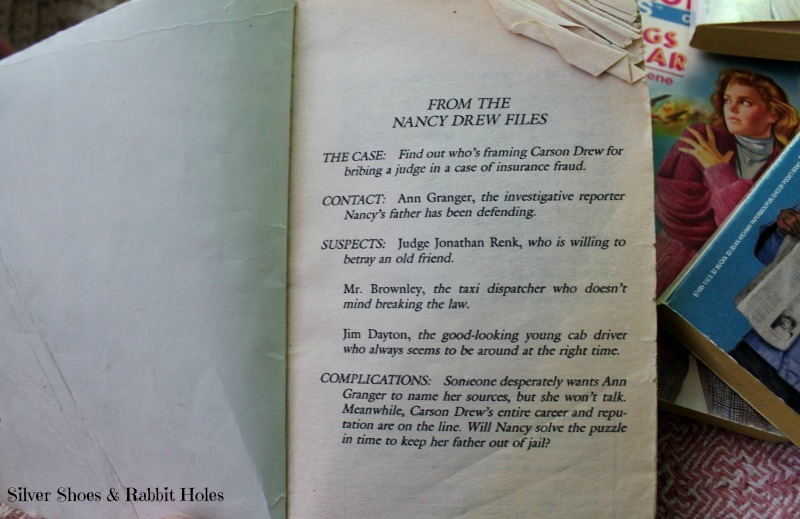 I was an avid reader of The Nancy Drew Files. Look at Nancy, a modern '80s teenager. Look at the romance novel covers, with a hunky guy always posed behind her. (It was seldom Ned Nickerson, although he is still her boyfriend through most of the series.) The modernized series made its debut the summer of 1986. Published by Archway/Pocket Books, a division of Simon & Schuster, the series lasted through 1997. The first thing I would do was read the back of the book. Ooooo, what's this one about? Then I opened the front cover. 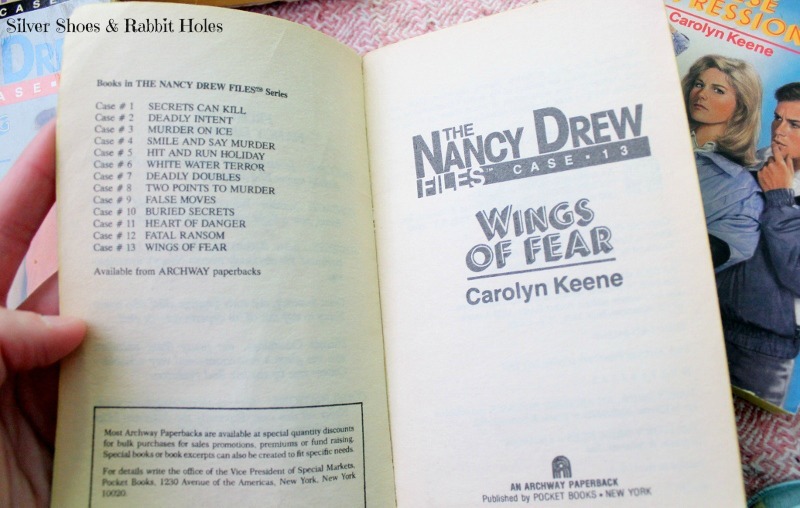 It was always the same: "From the Nancy Drew Files..."
Then I would read the list of books in the front, mentally checking off in my head which mysteries Nancy had solved until now. When I was in fifth grade, 10 years old, I went as a book for Halloween. I made myself a sandwich board out of two pieces of poster board and did my best to recreate the front and back covers of the latest Nancy Drew Files installment, Case 17: Stay Tuned for Danger. If I knew where any pictures might be, I would post one, I assure you. The books were such trashy fun. Romance, danger, fashion, thrills... 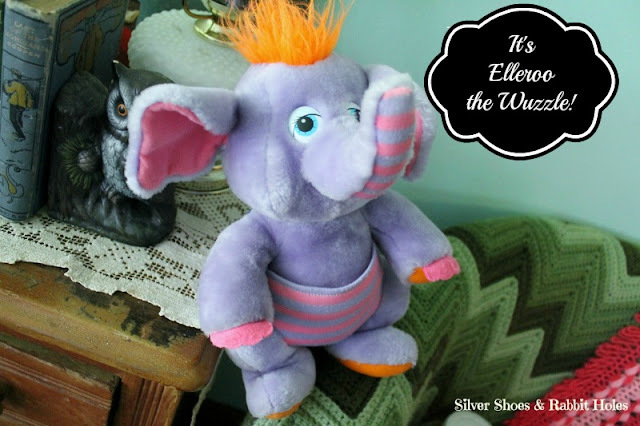 I read my series until I was 13 and in the eighth grade, then decided I had "outgrown" them. Series books about teenagers were only fun when I was a preteen. I think it's because my own high school experience was so far removed from Sweet Valley High... I stopped reading in 1991, on book 50-something, maybe 60-something. You can still find used copies of the books at Amazon, among other places. 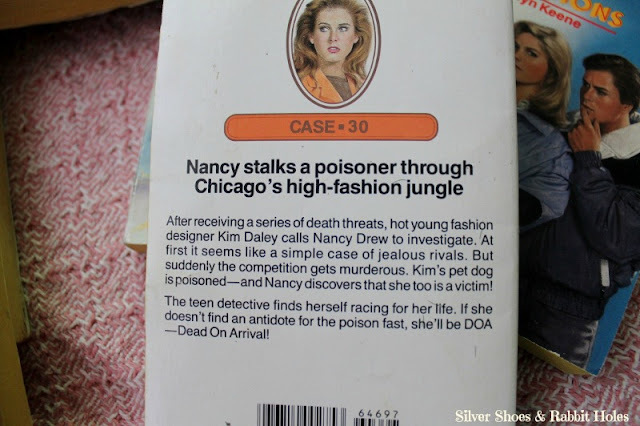 You can read more at this Nancy Drew website and here on this series book fan site. ("Mom! I saw one of those at Grandma's! When Mr. B and the girls went to my grandma's yesterday to check on Mabel the kitten, I asked him to bring me back a handful of my Nancy Drew Files books to blog about. I loved The Nancy Drew Files, too! There was a B. Dalton upstairs in Penn Square Mall in Oklahoma CIty when I was a kid and that's where I bought most of my Nancy Drew Files (and the Nancy Drew/Hardy Boys supermysteries) and my Sweet Valley books. I didn't read very many Sweet Valley High books but I was addicted to Sweet Valley Twins. Those books gave me an extremely warped view of what middle school would be like! I read Sweet Valley Twins, too! I started reading those before I started Sweet Valley High. I was in fifth grade, and after reading a few of those, I started on Sweet Valley High. Yeah, my middle school experience wasn't like my series books, either. Ok so I may be aging myself something fierce, but I used to watch the show! with pamela sue anderson! did you ever see that? i watched the Hardy boys too! with shawn cassidy! thanks for Pound Puppies mention. Julia just finished watching EVERY EPISODE of My Little Pony and we need a new show for her to watch! I've seen re-runs, but I admit I turned the channel. They weren't like the image in my head! In fact, I have trouble watching any Nancy Drew film or TV adaptations, even the old ones from the '30s and '40s starring Bonita Granville. Big Sis is loving Pound Puppies. Her other favorite shows are the old Dennis the Menace and Fetch! With Ruff Ruffman. Little Sis loves The Mighty B!, My Little Pony Friendship is Magic, Ruby Gloom, and they both like Phineas and Ferb. It sounds like they watch so much TV, but it all gets rotated out. We also made a YouTube playlist of old Muppet Babies cartoons... Big Sis LOVES those. Love those 80's book covers,LOL! AND YOU DRESSED UP AS A NANCY DREW BOOK... you are awesome, hahahah!! My little brother had a Pound Puppy, I remember his name was Goober. :) Keira's been watching it on Netflix too. Thank goodness - I need a break from My Little Pony - it's getting too annoying! I agree with Lisa - so nice to find other people who love vintage stuff, especially books! I think I had a Pound Puppy. I'm almost certain I did. Or I played with one at a friend's or babysitter's house. I can't remember. I remember loving the original cartoon, though. 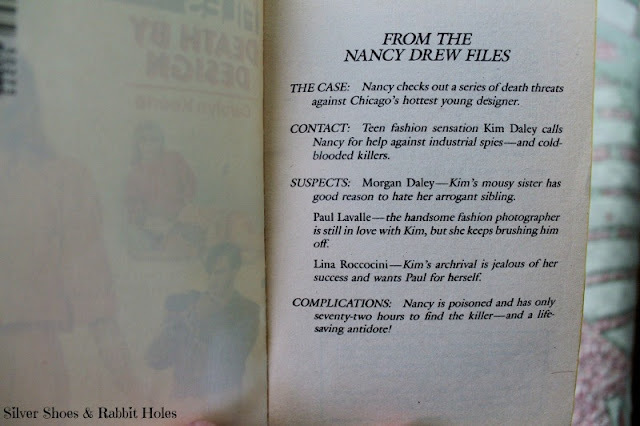 The Nancy Drew Files were my gateway books too! I collected them all- I would wake up early in the morning so I could read before school. In the winter I would curl up in front of the kitchen heater on the rug with a blanket and a Nancy Drew... I devoured those books! Good memories! Oh My Goodness! I read all of these! I loved these! Thanks for taking me back to a time when all I had to worry about was what mystery Nancy was going to solve next. I love these posts. (I almost died when I saw the Mr. Boogety post, my brother, sister and I loved that movie! I think my mom still has it. I will have to look for it next time we are at her house.)Thanks! Yay!!! 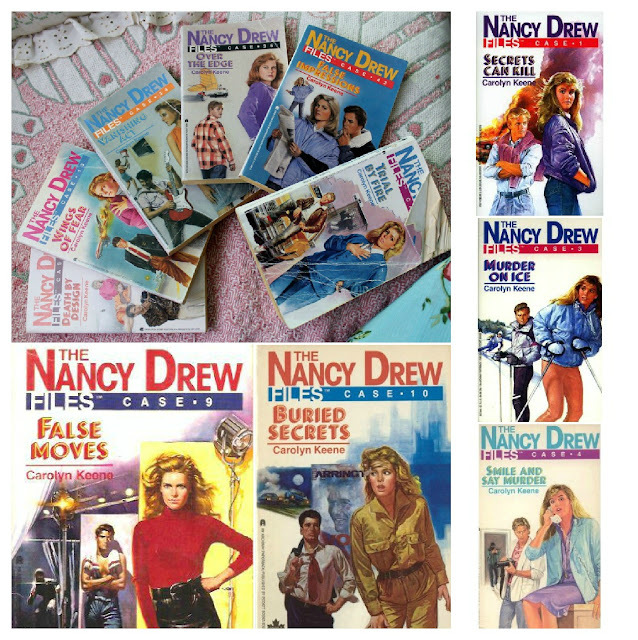 I had lots of friends who read Babysitters Club and Sweet Valley, but not many of us were into the Nancy Drew Files. I had a friend in the 5th grade who read them, and the pastor's daughter at my church read them. It's so cool to find others who loved them, too! My library bag is so full and I'm supposed to be memorizing a script, but after my load lightens up, I may reread the first book. Mr. Boogedy was such a favorite of ours, too. We watched most of those original Disney Sunday Night Movies in the '80s, but the Boogedy flicks were the best.